Cancer patients and cancer survivors may be at increased risk of infections. Sometimes, this increased risk is due to side effects of cancer treatment (either chemotherapy or radiation therapy). In other cases, factors such as older age may increase the risk of infection. This website provides patients with a resource to learn more about their risk of infection as well as guidelines on how to reduce this risk. It is important to consider this information as a guide only, and that it is only intended to be considered in conjunction with your health care practitioners advice. Information sheets by Dr Amy Loughman, Mood and Food Centre, Deakin University. Do you have an allergy? Allergies come and go and allergies that we thought we had in childhood may no longer exist. 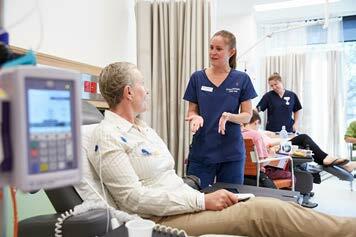 Our Doctors run allergy clinics at Austin Health and the Peter MacCallum Cancer Centre that can determine what you are currently allergic to, which can help your treating team make the best decisions about which antibiotics to give you. Follow the link for more information. We have compiled a fact sheet addressing common questions and concerns for cancer patients on their infection risk.